The photo to the right is of a gyrocopeter in flight, it demonstrates the angled rotors very well, as discussed in the narrative below. The image can be enlarged by double clicking on it. I ACCIDENTLY ERASED MY ORIGINAL GYROCOPTER INFORMATION PAGE, AND THIS IS A RECONSTRUCTION, CLOSE BUT NOT EXACTLY A COPY OF THE FIRST ONE. Please note, I use all of the above words describing basically the same machine in the article below, as they are for the most part interchangeable, though purists will get heart burn over that statement. Most gyro enthusiasts use the term ‘gyrocopter’ however the FAA prefers ‘gyroplane’. It is not a helicopter, nor is it an airplane, but actually has features of both. It has overhead rotors like a helicopter and also has a propeller like an airplane. However, the rotors have no power to them to make them go around. It also does not have a tail rotor like helicopters which on a helicopter keeps it from spinning around in circles and also is used to help it change directions. It does not have any wings. So! How DO they fly? No wings, no power to the rotor blades! Except for gyro-gliders, gyroplanes have a propulsion engine. Usually a gasoline powered engine with a propeller. The rotors are angled slightly to the rear, i.e. the front blade is angled upwards and the rear blade is angled downwards, with the underside of the rotor disc* exposed towards the front. As the propeller (or jet engine, as the case may be) pushes the craft forward, air is forced backwards and UP through the rotor disk causing the rotors to spin, much like blowing air through a pinwheel. Gyrocopters were invented by a Spanish nobleman, Juan de la Cierva in 1923. The photo to the right is of an early Pitcairn autogiro, very similar to the original autogiro designed by de la Cierva. Note that it has wings and rear empanage like a regular airplane. It also has 4 rotors. He was a civil engineer who was self trained as an aeronautical engineer. He built his first airplane in 1912 and had designed and built several before tackling the gyrocopter. He was working on designing a trimotor airplane when it stalled and ‘spun out” almost killing him. “Stalling” occurs when the angle of attack (the angle of the wing in relation to the forward motion of the airplane) becomes too great and the wing (and plane) looses lift. LIFT is what keeps the plane in the air. Stalling results in the plane falling from the sky like a brick. Frequently, the angle of attack becomes too great on just one of the wings first, causing only one wing to drop, while the opposite wing is still lifting the plane. This unfortunate scenario causes the plane to fall from the sky and to also start spinning around and around at the same time which is definitely not healthy. This is exceedingly difficult to control (recover) and unless the pilot becomes aware of the situation very quickly and takes appropriate corrective action, the plane crashes, usually resulting in the death of all aboard. Modern aircraft design has mostly eliminated this tendency to spin when a stall occurs and is not considered a threat today. Private pilots are not even trained in spin recovery any longer.. However, Juan decided that he could do something about the problem and started working on a solution. Several people had already been working on a rotary wing concept for flying but all designs at the time had proved to be unsuccessful as the machines tended to flip over while in flight. Juan figured if he could successfully adapt the overhead rotor concept that he could build a flying machine that was stall and spin proof. One day when he was at the opera, he was daydreaming about aircraft design rather than the watching the opera (go figure!) when the problem with rotary wing aircraft came to him suddenly. The advancing rotor was creating lift, however as it was retreating (on the other side) it lost its ability to create lift and the resulting imbalance caused the craft to flip over. If he could devise a method to alter the angle of attack as the blades spun around, he could balance the ‘lift’ and keep the aircraft flying. He began working on the problem and came up with the idea to mount the blades (rotors) on a hinged hub, thus permitting the rotors to ‘flap’ as they rotated, providing the constant adjustment in the angle of attack to keep the rotors in a ‘lift’ attitude all the time. His idea worked so well that his fourth design concept proved to be successful. Obviously he was very, very smart, as he not only came up with a workable design, be he also got somebody else to be the test pilot for his new machine, a Spanish Army Lieutenant, Gomez Spencer. He called his new machine an ‘Autogiro’ and patented the design concept and name. Harold Pitcairn of Philadelphia, PA obtained the rights to build autogiros in the United States. Pitcairn also had an airmail company, which successfully flew planes of his own design. This company, Pitcairn Aviation Inc; was later sold and was to later evolve into Eastern Airlines. Another company, Kellett Aviation; also obtained the rights to build the autogiro and was famous for providing the first rotary wing aircraft to the United States Army (air corps) which were used extensively until WWII. Admiral Byrd also used a Kellett Autogiro (a K-3 model) on his expedition to Antarctica in 1933-34. However, the rise of the autogiro rapidly begin to wane with 1) the advent of WWII and 2) Sikorsky’s successful adaptation of power to rotary wings in his first helicopter design. At that point all military money for rotary wing aircraft was diverted from autogiros to helicopters, as the ability to lift vertically and also to hover, more closely met the military’s criteria for rotary wing aircraft. The autogiro seemed destined to oblivion. The Germans and the British both used unpowered autogyros (auto gliders) in their respective submarine services as towed look outs. Diesel submarines had to spend a lengthy amount of time on the surface running on diesel, recharging their batteries. It was during these recharge periods when they were most vulnerable to attack, both from the air and from surface vessels. The lookouts on the low lying submarines did not have a very good field of vision to identify approaching enemy craft (air and sea). By towing a gyro glider behind the sub on a long tether, which permitted the gyroplane to reach 100or more feet in elevation and permitting excellent field and range of vision, permitting more timely warning of danger. The pilots of these gyro gliders were usually connected to the sub both by a tow cable and a telephone line. It is thought that on occasion, the German sub commanders were so anxious to ‘dive’ that they left their unfortunate gyro pilot on the surface to be towed under water and drowned. Interest in the gyrocopter continued to fade throughout and immediately following WWII. 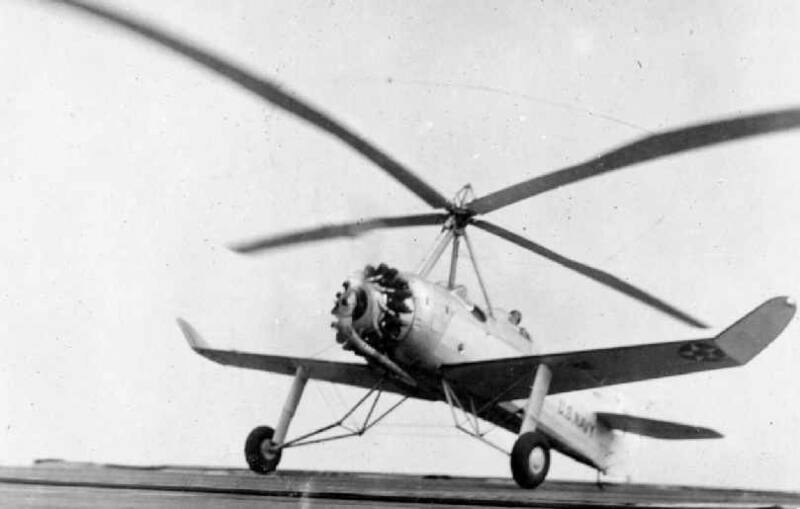 In 1947 General Electric purchased a British “Rotochute” (their version of the autogiro used on submarines during the war) and brought it to the USA for evaluation. They had one of their aeronautical engineers to evaluate it, (Igor Benson*). General Electric decided that they were not interested in gyrocopters and dropped the project. However, Mr Benson was very impressed, and quit his job with GE and started his own gyrocopter business. Mr Benson could not use the term ‘Autogiro” as Mr Cierva had already patented that term, so he chose the name gyrocopter for his machine. He developed his own design, based on the autogiro, and developed a ‘kit’ which could be purchased either as a packet of instructions, or as a set of parts which could be assembled by the buyer. Through his efforts the ‘sport’ of gyrocopter flying became a popular avocation in many areas of the US. His early kits did not provide for an engine, this model was known as the B-7. Later he added a mounting kit for an engine, dubbing this design as the B-7M and later an improved version the B-8. At the time a popular engine for the gyrocopter was the McCullough drone engine (70 and 90 horsepower) used by the Army Air Corps to power target drones. There were hundreds of these engines available in the post war era and they were relatively inexpensive as military surplus. Unfortunately, most of these have all been used, and have been worn out. Other popular engines adapted for gyrocopters is the VW pancake engine, and the Subaru engine. Both are still used frequently. Rotax has developed a series of light engines for use in light aircraft and today they power most gyrocopters and other ultra-light aircraft. Gyrocopters do not have a 'tail rotor' like helicopters as there is no power applied to the rotors. The powered rotors of a helicopter cause the machine to want to rotate as the rotors turn. The tail rotor was added to apply opposite force to keep it flying straight. Many design developers have adapted the basic Benson design with their ‘improvements’ which each are certain creates the perfect gyrocopter. These are easily recognized with the “B” designation in their names. They say mimicry is the ultimate form of praise. Commander Wallis (of England) is notable in that he flew one of his highly modified gyrocopters “Little Nellie” in the James Bond movie “You Only Live Twice”.
. If you enlarge the photo (by double clicking on it) you can see the tow line extending in front of the machine. It is connected to the bumper of a pick-up truck, but the truck is stationary. The winds blow so hard in the high desert, around 35 MPH the day this was taken, that the gyrocopter was flying in place as the wind was providing sufficient 'lift'. Remember, these birds can fly at around 15 MPH. They used the gyro glider towed behind a vehicle as a training vehicles for these newbees, to diminish the danger involved in learning to fly. Marian Springer, one of the very first FAA certified flight instructors for the gyrocopter, developed a two seat gyro glider to enhance her training, as she could then accompany the student on their early flights. The ‘two’ seats was really only one, just an extra wide webbing bench (similar to a webbed aluminum lawn chair) wide enough for two people to sit side-by-side. However, this concept made learning to fly a gyrocopter immensely safer. Her story is available in her book “Born Free, My Life in Gyrocoters “ and is truly fascinating reading. It can be purchased at her web site www.msgyro.com. Bill Parsons expanded on this concept and developed a tandem powered trainer, which is still used today. 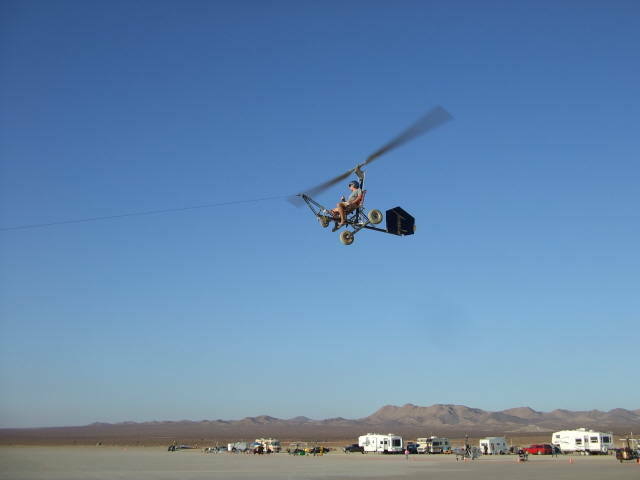 If you are interested in learning more about the world of gyrocopters, I have provided adresses to various web sites below including for the ‘Popular Rotorcraft Association’ (PRA), an organization for gyrocopter and helicopter enthusiasts the world over. There are clubs in most states and in several countries. Gyrocopter 'kits' cost around 11 to 15 thousand dollars and take about a year to construct. Downloading the plans off the internet, buying, cutting and drilling the parts yourself, and using a used engine, one can be built for around 5 or 6 thousand. Certain parts should not be 'home' built. Such as the rotors and rotor hub. These are rather complicated and much too critical for function and safety to risk 'messing' them up. This ‘blurb’ on gyrocopters is much longer than I originally intended, however, it still doesn’t cover the bases thoroughly enough, and I encourage you to peruse some of the web sites below for a deeper understanding of the subject. www.vectorsite.net/avgyro.html a very informative site providing the history and development of the gyrocopter. www.xenongyroplanes.com The Xenon is the crème de la crème of private gyrocopters, a little pricey but a beautiful bird. www.groenbros.com/index.php Groen Bros are developing commercial gyrocopters. They also produce the SparrowHawk, a 2 place small gyrocopter. www.youtube.com/watch?=gb8FmjIWyPO a Ken Brock demonstration on how to fly a gyrocopter. There is a #1 and a #2 clip in the series. Ken Brock was killed in a conventional aircraft accident a few years ago. http://www.pra.org/index.php?option=com_content&view=article&id=74%3Aigor-bensen-tribute&catid=35%3ATribute&Itemid=28 This site is a page on the PRA web site and provides a fairly good history of Igor Benson and his efforts in developing and marketing the gyrocopter. http://www.gyroplanepassion.com Another web site dedicated to gyrocopters. Just chock full of information. *(1)Rotor Disc; the total area covered by the rotors as they turn a full circle. The price starts around $60,000.00 and goes up. Rotorcraft magazine usually has a list of instructors who are actively training new pilots. Unfortunately, they are few and far between and you may have to travel some distance to seek training.